Can anyone tell me how to break in a new rifle barrel? There are as many opinions on this subject as there are shooters and barrels. And as many variables too. Clean it when it needs it. To understand one POV on breaking in barrels, go to the Krieger barrel website and review their information. IMO, following a good breakin proceedure can have advantages in the accuracy and the cleaning of a properly broken in barrel. Kreiger tells you why. FWIW, Krieger is the top barrel in competition today. IME, whether button rifled, hammer forged or cut rifled, barrels that have been broken in carefully can be examined before and after for results with a good bore scope when you look at the rifling at 20X. There is a difference. But, regardless of one's position, there is nothing I can think of that is negative about using a good break in process. Most of my guns were bought off the used gun rack so someone else broke them in. They shoot just fine. But, regardless of one's position, there is nothing I can think of that is negative about using a good break in process. Can't argue with that .................. whether it makes a difference how it's broke in is harder to tell. Man I did not know that this was such a touchy question. Heres another one. I wonder If the bullet weight would come into question? I have 30.06 rounds in 110gr to 168gr that I have loaded. Would bullet weight and heavy or light loads make a difference? I've been loading pistol ammo for over 20 years and just started with rifle rounds. In all my pistol barrels break in was never mentioned. I just wonder why? The problem with this question is that it gets down to what you yourself believe. Some barrel makers say that their barrels will never be better than the minute they roll out the shop door and firing a round through them leaves 1 less round in the barrel's life. Other barrel makers say a good barrel should be treated with care and broken in properly for the best performance. So the barrel makers themselves do not agree and I have spoken to a few about this very subject when I was the industry director for a national shooting orginization. I have shot in competition for many years, put on many championship matches and have been the match director at four world championship matches. I watch and listen a good bit. I also shoot pretty good for a half blind, old fat man. One thing that I noticed is that every champion shooter has a ritual and I do not recall any champion shooter that I have ever met or heard of, that does not break in a new barrel before starting a new season with that new barrel. Now I am not talking internet expert shooters or gun writers that do not know crap from Crisco. Most casual shooters do not understand that when you learn the basics, develop the load and get the sight settings for that load, 98% of every shot after that, is just a mental process. So Handloader is 100% correct. Even if it does no good to break in the barrel, it does no mesurable harm either and if it is your preperation process, by all means do it. But if you think it helps, it does, simply because you think it does. I break in all of my barrels except the shotguns. I use the same process I use Sweet Shooter and follow their reccomended prep process. This is their site. If you have never tried it I suggest you give it a try with a new barrel or with an old barrel stripped of all copper. One point about the SS process; I do not use a stainless steel brush in my guns. I use a bristle brush to wet the bore. Oh, they seem to have some lab test data that supports barrel prep. just when is that new howa showing up? yak at ya later, ed. .New here also, but seen an opportunity to add my 2cts. to this thread. IMO, you just spent good money on a new outfit. Why wouldn't you want to do what is recommended? I recently purchased a new Savage. 22-250. I followed there break-in to the T. I consider it more as seasoning the barrel, as it got easier to clean with each step. I have only shot just less then 50 rds. and have already figured out it was going to be a dirty gun. By that I mean it shoots better with several rounds thru it w/out a brush job. I have no intentions of cleaning this gun with less then fifty rds. unless it is going to be stored. Even at that it will only get chemical's an patches. It will not see a brush until 200+ rds. or if it starts shooting weird. 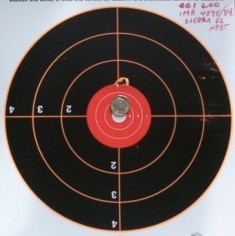 My 3 shot groups really started coming together after 5 sets dirty at 100 yd.